1. Monitored by a Child and Adult Care Food Program (CACFP) sponsor organization that contracts with Arizona Department of Education (ADE). 2. The Arizona Department of Economic Security (ADES) will reimburse a portion of child care expenses for families who qualify for child care assistance and who choose a provider that holds an ADES contract. 3. CACFP will pay CACFP - contracted child care providers a portion of food cost when providing meals to children in care. Public Preschools: The Arizona Department of Education (ADE) administers and oversees public preschool programs in Arizona. These programs are licensed by AZDHS, Bureau of Child Care Licensing and are provided through public schools including charter schools to provide early childhood education with a goal of preparing children for kindergarten. Public schools may offer many options for children with varying abilities and income. Early Childhood Special Education Programs: The Arizona Department of Education (ADE) administers and oversees special education preschool programs in Arizona. Families and children are required to meet eligibility requirements in order to attend. 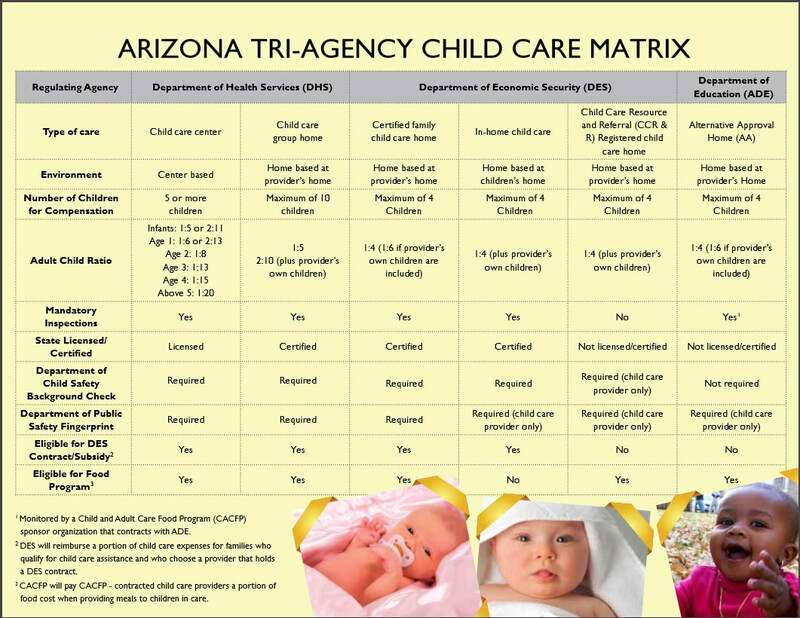 Family child care homes are certified or registered through the Arizona Department of Health Services, Bureau of Child Care Licensing (AZDHS), OR Department of Economic Security, Child Care Administration. You have three options when it comes to family child care settings: AZDHS Child Care Group Homes, DES Family Child Care Homes or CCR&R Registered Homes. DHS Certified Child Care Group Homes are certified and monitored by AZDHS. They may provide care for up to 10 children at one time for compensation. They must maintain at least one staff person for every five children in care. These homes may contract with DES to serve families that receive DES child care assistance. DES Certified Family Child Care Homes are certified, monitored and contracted by DES. They may care for no more than four children at one time for compensation. They may care for children whose families receive DES child care assistance. ​CCR&R Registered Family Child Care Homes are not certified or monitored by any state agency or CCR&R. They may care for no more than four children at one time for compensation. Registered family child care home providers have a Child Protective Service (CPS) clearance, are fingerprinted for a criminal background check, have provided proof of current training in CPR and First Aid, and have submitted a sworn statement attesting that if they have a pool, it is fenced and that any firearms in the home are locked and stored separately from the ammunition. Family Child Care Providers that are not certified or monitored by any state agency, and that do not meet registry requirements are not listed with CCR&R. ​In-Home Child Care is provided by an individual who provides care in your (the parental) home. Arizona does not require in-home caregivers to be regulated as long as they care for no more than 4 children at one time for compensation. If the family is receiving DES Child Care Assistance than the in-home provider must become DES Certified and Contracted in order to receive child care assistance payments from the state. Care may be provided in the child’s or relative’s home but cannot be provided in both locations. The NCRP either provides care in the child’s home or their own home but not both at the same time. ﻿​School-age or Out-of-School-Time programs provide care for children who are in kindergarten through sixth grade. These programs can be offered in a family child care home or in a child care center. Care is also commonly provided in other locations such as a public school, community center, city parks and recreation programs, or summer camps. These programs may be licensed or license-exempt, depending on the facility. School-age care is not eligible for a Quality First Star Rating. The Arizona Center for Afterschool Excellence offers a free Arizona Afterschool Directory for families to look for school-age and/or recreation programs in their area. The Arizona Afterschool Directory is a free resource for parents to search for out-of-school time (OST) programs by location, services, ages of the youth served, and other criteria and view the findings on a map-based interface. Search the Arizona Afterschool Directory here. Alternate Approval Child Care Homes (AA) participate in the Child and Adult Care Food Program (CACFP) and must meet minimum federal requirements. They may care for no more than four children for compensation. They are monitored by the Arizona Department of Education and AA homes are not licensed or certified. Anyone providing child care whether it is in a licensed, certified, registered, or non-regulated program may participate in the Child and Adult Care Food Program (CACFP). Centers, child care group homes, family child care homes and non-regulated home caregivers may choose to participate in the Child and Adult Care Food Program (CACFP) and receive reimbursement for nutritious meals served to the children in care. DES does not contract with these providers to care for subsidized children unless they become a DES Certified Family Child Care Home. They may only list with Child Care Resource and Referral if they become registered with CCR&R. Family, Friend and Neighbor care is exactly just that. It is when your child is cared for by a family member, a friend or a neighbor so you can work, go to school, attend events, or have respite care. The Arizona Kith and Kin Project, a program of the Association for Supportive Child Care, works to improve the quality of care provided by "kith and kin" (family, friend and neighbor) child care providers. Kith and kin providers care for the children of friends and family members and are, for the most part, unregulated. The Arizona Kith and Kin Project is funded by First Things First and the Valley of the Sun United Way.